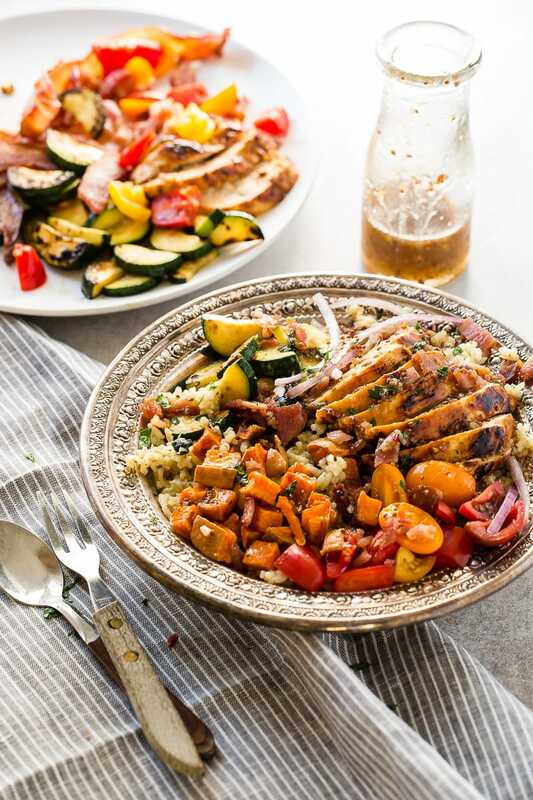 Need recipes for holiday leftovers, but also need quick and easy healthy recipes? Honey mustard chicken with spinach and artichoke rice bowls are it! This post is sponsored by Knorr, but all opinions remain our own. 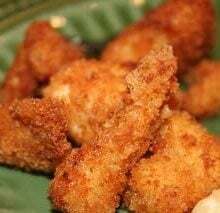 This recipe is so simple and best of all, it uses up all of those extra leftovers you don’t know what to do with and transforms them into a delicious meal. 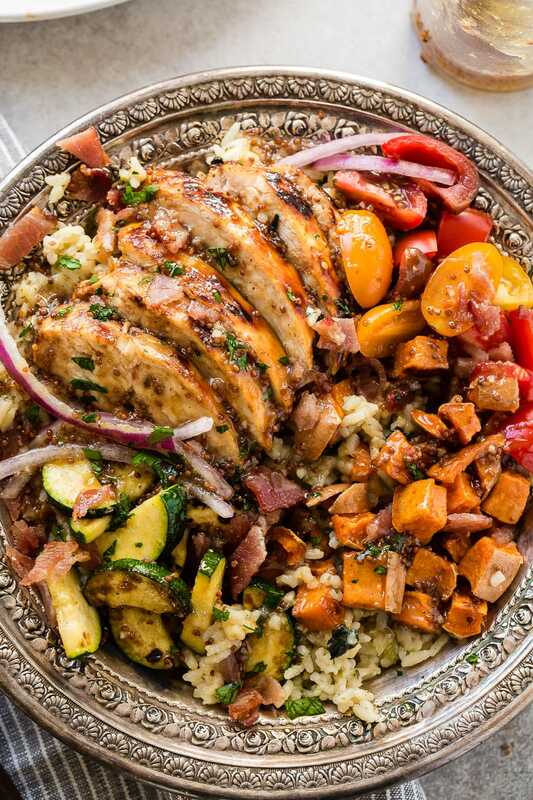 Just take Knorr Selects Spinach & Artichoke Rice combined with any of your favorite leftovers into this Honey Mustard Chicken with Spinach and Artichoke Rice Bowls recipe that’s sure to please everyone and you’ll feel good about eating. 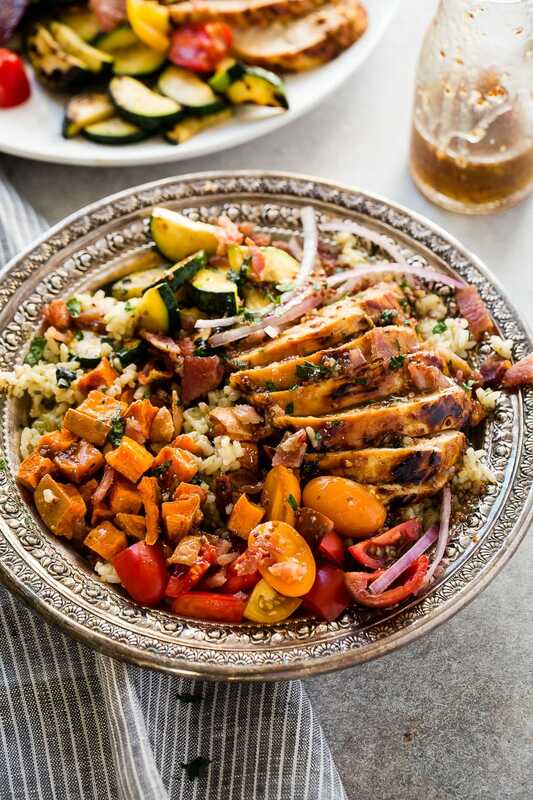 We love that this recipe brings together seasonal winter ingredients and flavors, but could totally be pulled off year-round. 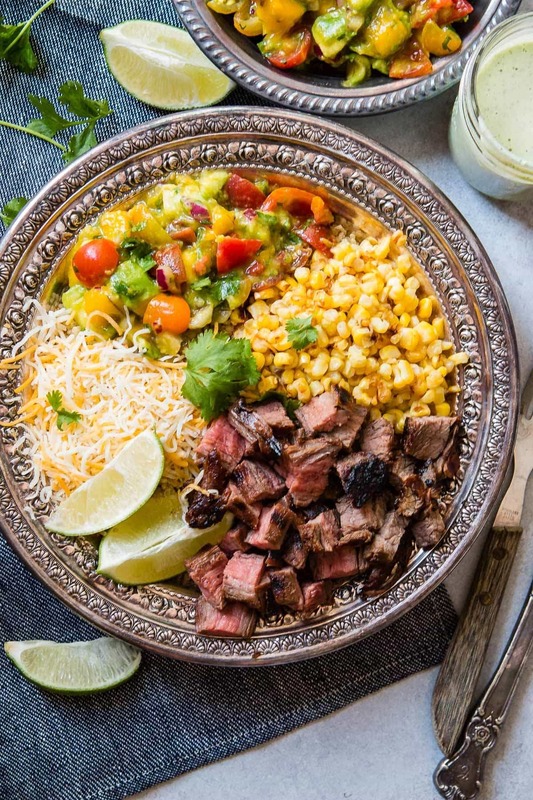 That’s the hard thing about some recipes, they just aren’t easy to make in the winter because of ingredient availability, but protein bowls like this one can use anything you’ve got in the pantry and fridge, asparagus, corn, avocado and so on. When Cade and I first met, I was teaching Pilates and he was a personal trainer/ Abs that Rock instructor. Yes, his class was literally called, Abs that Rock. Welcome to college life. Health and fitness brought us together and we continue to try to keep that an important part of our lives. 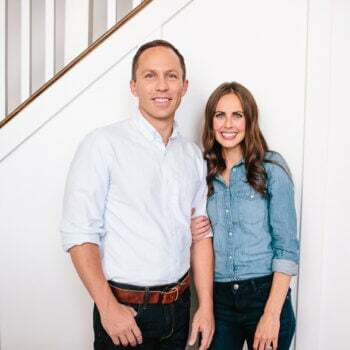 Unfortunately, the older I get the more I realize that the Holidays take a real toll on adults; constant errands, school projects and tests before the end of the semester, gift shopping and wrapping, planning for company, chores, holiday meal planning and more! We end up tired, stressed, and on the constant hunt for quick and easy recipes that are delicious too. And worst of all, whether we’re the host or the guest, somehow we always end up with all of those leftovers that you don’t want to waste but don’t know what to do with. This happens to us allll the time. Pretty quickly in our marriage I learned that I could my family make healthier choices and still use up leftovers by turning them into something new. We had bacon from a breakfast, tomatoes from a salad, sweet potatoes left over from our Sweet Potato Casserole, zucchini because I forgot I already had zucchini and bought more-ooops, and finally condiments coming out our ears from all the different recipes from holiday meals and no one needs 50 kinds of mustards with only a little in each jar. Is this what your house is like? 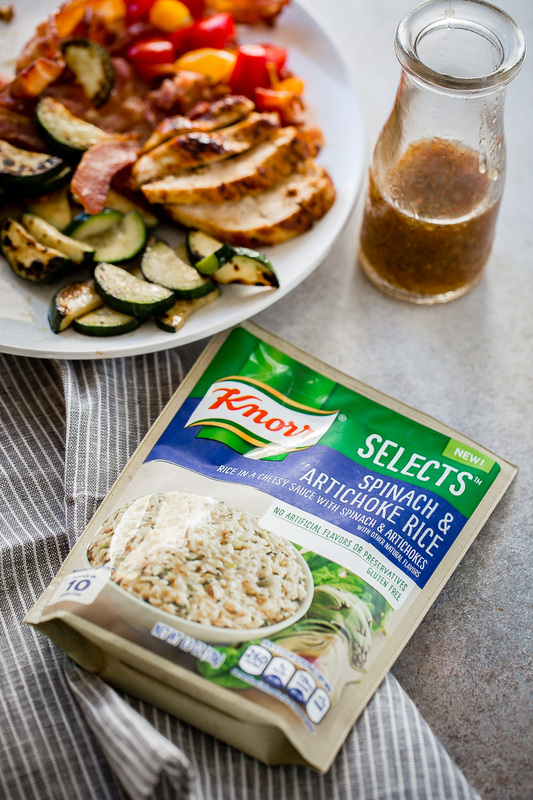 Throw a little chicken in a marinade, reserving some as the dressing so you don’t have to make extra recipes, cook it up in a pan and meanwhile get that Knorr Selects rice cooking on the stovetop which is the best time saver ever at our house. 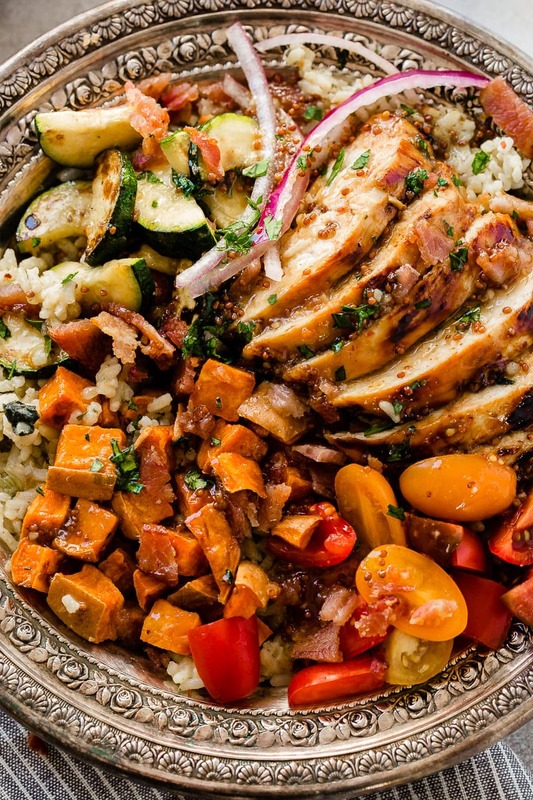 Everything gets piled up in a big bowl making it satisfying and perfect for using up leftovers. 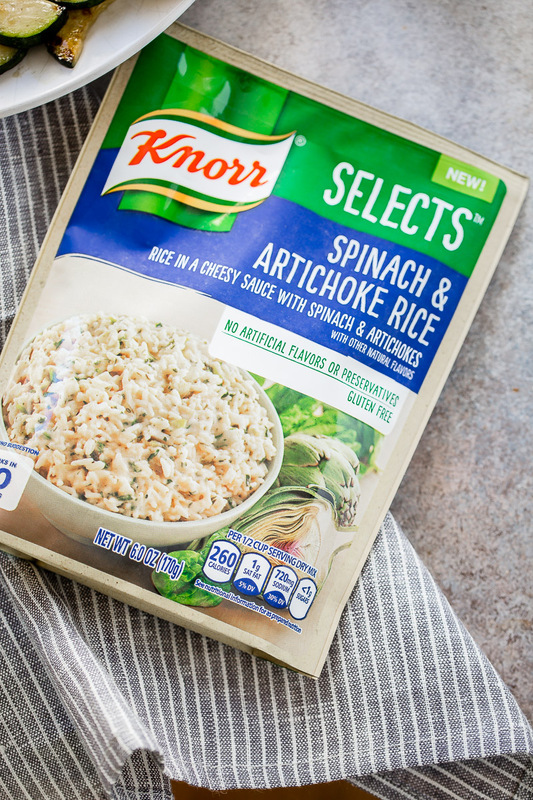 It’s great for guests too because Knorr Selects have no artificial flavors or preservatives and are gluten-free, using responsibly sourced rice from Arkansas. 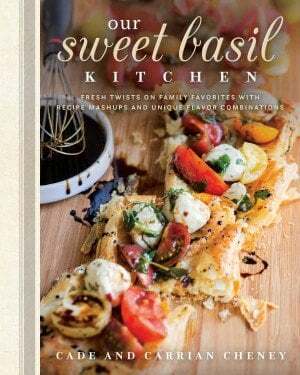 So, even your friends with dietary restrictions can enjoy this recipe, choose their toppings which is always fun no matter how old you are. You can also swap out any of the other Knorr Selects flavors for this meal as well. 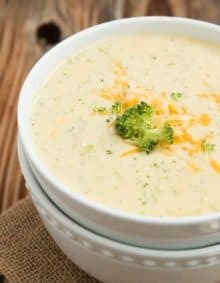 In a measuring cup, whisk together all of the ingredients for the dressing. Pour 1/3 into a ziptop bag with the chicken breasts. 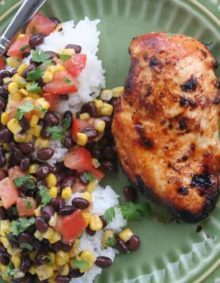 Allow to marinate for 1 hour, or up to 24 hours. Heat an oven to 400 degrees. Drizzle a little avocado or olive oil on the pan and toss the sweet potatoes until evenly coated. Sprinkle evenly with 1 teaspoon of salt. Roast for 20 minutes or until tender, remove from the oven. Heat a skillet over high heat with 1-2 tablespoons of oil. Once shimmering, add the chicken, top side down, and turn the heat to medium low and cook for 6-7 minutes. See our chicken in a pan guide for further instruction on how to cook chicken perfectly without cutting into it. Flip the chicken and continue to cook for 6-7 minutes or until cooked through. Set aside on a cutting board for 3-5 minutes to rest. Add a little more oil to the pan and turn to medium heat. Add the zucchini and 1/2 teaspoon of salt. Cook, flipping occasionally until browned and tender, about 3-5 minutes. Meanwhile, prepare the Knorr Selects Spinach & Artichoke rice according to package directions. 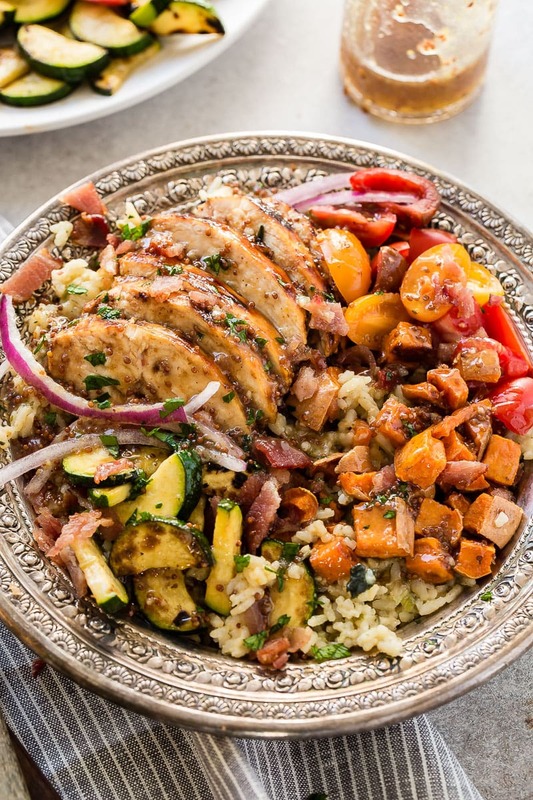 To assemble, place the rice in a dish and top with all other ingredients, chicken, zucchini, bacon, sweet potatoes, onions and tomatoes. Drizzle with dressing and enjoy!